In this lousy market, don't be your own worst enemy. Here are the most common mistakes candidates are making -- and how to fix them. 1. If you only know someone through a social networking site like LinkedIn or Facebook, it's inappropriate to ask him or her for an in-person meeting. (NEW YORK) Fortune -- Dear Annie: A few months ago I lost a middle-management job at a company where I worked for 14 years. I received four promotions during that time, but it had been quite a while since I actually interviewed for a new job. Dear Rusty: You aren't necessarily doing anything wrong. With unemployment now at 10.2% nationally, and much higher in some states, the U.S. Bureau of Labor Statistics calculates that there are 6.3 job hunters for every available job. That's three times the average that prevails in a healthy economy, the BLS notes, so the numbers may simply be working against you. But before you invest in a coach, see if you're making an easily avoidable mistake you could clear up on your own. "The competition is tough enough without giving potential employers reasons not to hire you," says Tim Schoonover, chairman of outplacement and leadership-development firm OI Partners. 10. Over-explaining why you lost your last job. It's okay to mention that your last position was eliminated, but then move on to what you can do for this employer. 9. Conveying that you're not over it. "During interviews, some people are acting wounded, angry or sad," Schoonover says. These are normal emotions after a layoff but they don't belong in a job interview -- or you may "seem unstable and communicate that you don't grasp the business reasons for layoffs," he adds. What's the worst blunder you've made in a job interview? Leave your comments at the bottom of this story. 8. Lacking humor, warmth, or personality. Many anxious job candidates are "one-dimensional during interviews, and are too focused on getting their talking points across," notes Schoonover. "Don't forget to show qualities that can be a real plus in the decision-making process, including humor in good taste, warmth, and understanding." One thing interviewers want to know, of course, is how pleasant you would be to have around the place every day. 7. Not showing enough interest or enthusiasm. After all, "companies are looking for people who are excited about working with them," Schoonover says. 6. Inadequate research about a potential employer. It's essential to be up on the latest news, so be sure to Google the company before the interview. Be prepared with well-informed, thoughtful questions about its products or services and its future plans. Many applicants aren't bothering, Schoonover says, and it shows. 5. Concentrating too much on what you want. Focus more on what the interviewer is saying. Listening carefully is crucial in steering the conversation toward how you would fit in and what you have to offer. 4. Trying to be all things to all people. "Devote most of your effort to talking about what you know you do well, and don't try to stretch your actual qualifications too far," Schoonover advises. A good rule of thumb: Don't apply for any job unless you have at least 75% of the stated qualifications. 3. "Winging" the interview. Schoonover hears from many hiring managers that candidates often aren't ready to answer difficult questions. So rehearse. "Prepare and practice a 90-second verbal resume, and some answers to possible questions, so that you come across as succinct," he suggests. 2. Failing to set yourself apart from other candidates. "You have to make the strongest possible case for why you are the best person for the job," Schoonover says. "Specifically address what impact you can have on sales, profits, costs, or productivity within the next three to six months. Use quantifiable achievements from past positions to back up your performance promise." 1. Failing to ask for the job. "You have a much better chance of getting the job if you ask for it," says Schoonover. "Close the interview by summing up what you can bring to the job, and ask for the opportunity to deliver those results." Talkback: Have you ever made a blunder in a job interview? 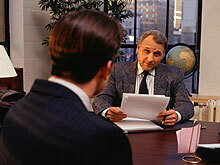 If you're a hiring manager, what are the worst moves you've seen interviewees make? Is there any way to win an employer over after making such a mistake? Tell us on Facebook, below.